As is often the case when a rebellion seemingly erupts out of nowhere, the impetus for the Boxer Rebellion in China had been brewing for quite some time. As the 19th century drew to a close, the Chinese were smarting from a humiliating defeat at the hands of the Japanese, a nation that China had never considered in their league. It was hard to feel superior to Japan when they had lost control of both Korea and Formosa to the much smaller country. The Chinese were also fuming with the Europeans who had infiltrated their country and were dominating both domestic and foreign affairs, while treating the Chinese dismissively at best and as slave labor at worst. Many of the upper class Chinese believed that the European presence in their country was the very reason for Japan’s victory. All of this anger led to a rise in nationalism and a strong desire to reclaim their country by ousting all foreigners. 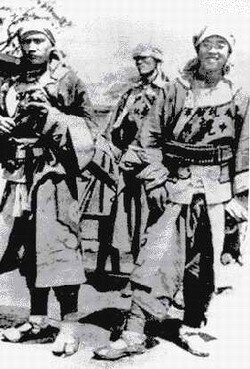 A group of peasants banded together in 1898 who styled themselves as the I-ho ch’üan (“Righteous and Harmonious Fists.”) They later became known as the Boxers due to the martial arts boxing rituals they performed. Their purpose was to rid China of all “foreign devils.” The Boxers had also originally intended to bring down the Manchus’ Ch’ing dynasty, but when Empress Dowager Tzu offered the rebellion her support, they concentrated fully on ousting the Europeans. By 1900, it was obvious to the Europeans living in China that their lives were in jeopardy. Regular attacks on foreigners and Christian Chinese had begun. The rebellion was making its way out of the countryside and into Peking, where the Chinese were treated very badly by the Europeans. There were many in the city very willing to join up with the rebellion. On June 20, 1900, Empress Dowager Tzu ordered all foreigners to be killed. As the miffed German ambassador made his way to the Royal Palace to voice his displeasure at how he and his fellow Europeans were being treated (carried on a sedan chair by four Chinese men), he was murdered. The other Westerners got the hint and holed up in the British Legation, protected by various soldiers and sailors who were woefully ill-prepared to face such an onslaught. They bravely defended their charges with what they had on hand, such as carving knives, until an International force arrived to quell the rebellion 55 days later. During the time of the Legation Siege, 66 Europeans had been killed and another 150 had been injured. This was an abomination from a Western perspective, and the International force took its revenge on the Boxers immediately, beheading them on the spot when caught. The Empress Dowager deftly switched allegiances, and despite her actions during the Boxer Rebellion was allowed to return to the Forbidden Palace with her family. The Chinese government was ordered to pay $450 million in damages as punishment, a vast sum of money, especially for a country as poor as China. Foreign troops were permanently stationed in China, and the Western presence and influence was even greater than before. Though they may not have suffered any immediate repercussions, the Boxer Rebellion was the beginning of the end for the Ch’ing dynasty. It hastened the Republican Revolution of 1911 when the monarchy was finally overthrown and China became a republic. Thanks for this well-written and informative article! I learned a lot from it.